Winston Blakely is a fine arts/comic book artist and former art teacher who was born in the Bedford Stuyvesant section of Brooklyn, New York. As a former schoolteacher, Mr.Blakely has taught art appreciation to many inner city children. He worked with Jackie Robinson Center's students to achieve 1st Prize in a City Wide Art Contest. Mr. Blakely has also lectured at Four Towns College on comic book history, pop culture, showing the relationship between Mythology, Religion and superheroes. His primary artistic influences include fantasy illustrators Frank Frazetta, Richard Corben and Fine Arts greats, such as Salvador Dalí, Romare Bearden and Jacob Lawrence. The great comic book artists of Marvel Comic's heyday are also a part of this dedicated artist's growth, such as Jack (King) Kirby, Steve Ditko, Wally Wood and Jim Starlin, Alex Toth and Gray Morrow. 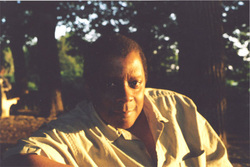 In 1993, Mr. Blakely was taken up to Voyager Communications by Comic Artist Yvel Guichet, where he got a job as a house inker for Valiant Comics in 1993. His inks are on such comics titles, like Eternal Warrior,Hard Corps, BloodShot and Solar, Man of the Atom. After the Valiant stint, he later did assignments for Visage Studios, working under the legendary Rich Buckler. This led to many Comic Conventions tours outside of New York City, like the Heroes Con in Charlotte, North Carolina, the ever popular Chicago Con and the fantastic Dragon Con in Atlanta,Georgia. One of Visage Studios' members, introduced him to the publisher of Millennium Publications, who was looking for a creator owned project featuring a female superhero. And thus Little Miss Strange was born. Teaming up with Luis Sierra,he created the realm of the world's first Black Alien Sorceress. It has gathered a small cult following in the New York City area and at the Big Apple Comic Book Shows. During the first Madison Square Garden comic show, he met the lovely Nicole Bowen who became the live embodiment of the Mistress of Magic, known as Little Miss Strange. In addition to his work on the Sorceress of Satu, Mr.Blakely has also produced his own sci-fi character, Pozitron, the black cosmic hero who can be found in the anthology called, Immortal Fantasy which features an introduction by Charles R.Saunders, creator of Imaro.Immortal Fantasy and Little Miss Strange are available at Amazon.com. In between working on storyboards for small independent films and illustrating children’s books, his current and upcoming projects include Vigilance and Midnight Phantom by Creative Elemantz Studios written by Jemir Johnson, both featuring art by Blakely. His current Fine Arts Exhibition was sponsored by Reconstruct Art, Jamaica Development Center, Purpose Lounge and Chashama. A group of collective artists working and living in Jamaica, Queens. 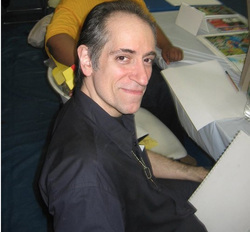 Luis Sierra a self-taught cartoonist, who resides in the Bronx. Many know him as the best hire gun cartoonist in the industry. His professional projects include Little Miss Strange for Millennium comics, Countess Vladirima for Brainstorm comics and Strange Corridor & Mala Noche for Creative One Comics. One of Luis Sierra biggest influences was when he attendant the School of Visual Arts in New York in the mid 1980’s. It was there that he really learned sequential art and story telling by legendary Bronx born artist Will Eisner.While learning storytelling art, another one of Luis teachers was Harvey Kurtzman who was teaching media art Mr. Kurtzman is best known for being one of the founders of Mad Magazine and Playboys Little Annie Fannie. After college, Luis found himself doing freelance art, with various artists that lead him to the wonderful world of comics. While working on his own personal projects, Luis sierra was approach by Winston Blakely to draw a project called “Pozitron” for the “Rich Buckler” Visage Studios. Other projects follow such as “Little Miss Strange” for the now defunct Millennium comics. Soon after that assignment came "Countess Vladirima" comic book for Brainstorm comics. After a series of Indy published projects, Luis Sierra along with co-creator and longtime friend Gary Camp decided to resurrect an old character named “Nocturna” which later became the vampire series called “Mala Noche’. This story is also being featured as an online mini series comic at pixelstrips. Recently, Luis Sierra has done cartooning work for various underground magazines publications; his other comic book works are with Blakelyworks and Creative Elementz Studios. Currently, Luis sierra is working on a series of graphic novels for Creative Elementz Studio and is also concentrating on finishing the Mala Noche horror series for Creative One Comics for 2012.